Hello everyone, welcome. I recently attended a gaming weekend for my friend John’s birthday. Much fun was had by all, and many games were played, not least of which was Zombicide: Green Horde. 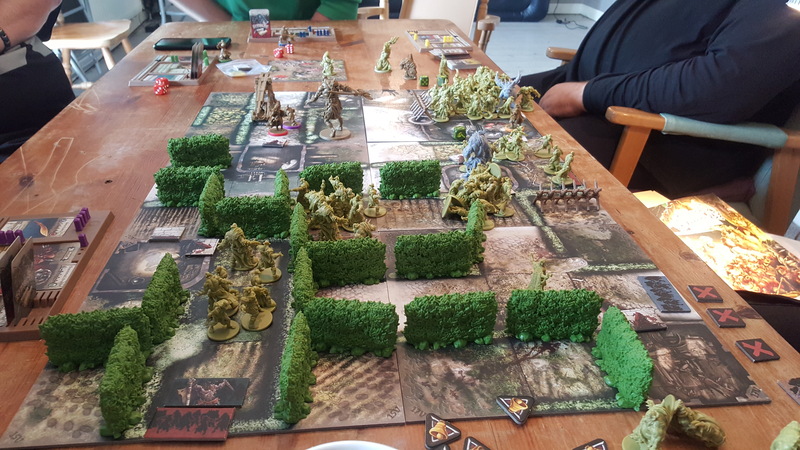 I’ve written about Zombicide before however, I felt I would share this experience as well as it was a fun game, and I think as a group we absolutely nailed it in terms of team work. I didn’t get starting shots before the game ended, so you’ll have to excuse the fact that the photos I took of our characters were from the end of the game. I was playing “Not-Snape”, Grayson Gruber. Looking at that picture, I forgot to assign my orange ability which was Spell Caster (one additional magic action). By the end of the game I was very good at dealing with large infestations of Trashmobs. I was rubbish with anything else but the trash I could take out. Other John was playing the “Not Game of Thrones Giant” Finbarton. Having seen him played in a few games, he is tactically one of the more useful characters in terms of being able to see over hedges and attacking adjacent squares. His ability to throw things makes him a really good crowd controller too, particularly if something big comes out. Patrick played Asmodeus, or “Not V from V for Vendetta”. I have played Asmodeus before as a melee damage dealer and he was a lot of fun. The choice to make him ranged was unusual but didn’t seem to hamper us any. Asmodeus was one of two casualties we suffered by the end. Simon played the Deathmaster, aka “Not Lemmy from Motorhead”. He proved to be a very effective melee combatant during the game particularly when I armed him with a War Cleaver (As part of the game I looted 2 Vault Items and kept neither as they were both Melee items and I was the only dedicated ranged attacker). The Deathmaster was our second casualty by the end of the game. Badger or, as we like to think of him, Dwarven “Not Wolverine” was played by Joe and was the recipient of the second vault item I looted (I was really generous that game. I could have kept them, but for the good of the team I shared. What was I thinking?). Badger took a wee while to get warmed up but that was because there were limited starting rooms for loot and 6 players, which also meant limited xp to share. (I took on an unofficial role each turn checking who was on what XP so we could keep it fairly balanced at the start. This meant the game didn’t spiral but it also meant Badger didn’t level or gear up especially fast, but when he did, aside from some stinkers of dice rolls he was a pretty solid melee combatant. Our final hero was Princess Ayla/”Not Wonder Woman” who proved to be incredibly useful given her super strength ability allows her to kill much larger creatures with base weapons right from the start. We also were able to loot the Tremor Enchantment which allowed her to knock down foes numerous times which helped with the crowd control in times where otherwise someone would have been killed. The Scenario was simple. There were 4 red objective tokens on the board. 3 of them were parts to the Trebuchet, whilst the fourth was a weapons cache. We had to assemble the Trebuchet and destroy the horde forming outside our village. We started with 4 spawn points, one of which was behind an impenetrable and immovable barrier, which meant that zombie spawns there would simply use up miniatures making extra activations a real risk. We were very close to a spawn point and there were few lootable rooms. We decided to hold the line for a few turns whilst we geared up. This consisted of some spellflinging by Grayson Gruber, and smashing by Finbarton and all of the others rotating through the room searching it for gear. We did a pretty good job holding the line where we were suffering no damage but the zombies were starting to pile up and in such situations even a powerful party can be overrun. Grayson Gruber and the Death Master made a break for the nearest search token, whilst the remaining party dealt with zombies trailing us. We needed to get a move on as the hissing and snarling of the zombie horde on the other tile was becoming alarming. Though, by this point I was a well equipped trash killer with two power wave spells meaning level 1 zombies were dead zombies. Having cleared away the threat to the rear, the party reformed as we worked best together. We were still in level 1 by this point as we strategically shared the kills. In order to deal with the horde, we decided to attack from all sides. Finbarton would strike with his reach, whilst Ayla and Badger would be the front line, I would hit them in the side through hedges whilst Deathmaster and Asmodeus guarded the rear. A surprise attack through a hedge was a risk for me as I had no line of sight to my intended destination, and the rules say that in such circumstances, roll a D6. On a 1, you get a zombie spawn. Fortunately I did not and was able to thin the next wave before ducking back through a hedge and cover. The strategy worked and we were able to thin the herd down considerably but we couldn’t help getting to level three with the amount of damage we were doing. We had to advance as we were once again in danger of being overrun and in any event we needed to complete the trebuchet. The Deathmaster had collected one part on our first breakout to the right and we now needed to advance up the board, through the herd before we were swarmed. We were fortunate. A few of the abominations, including the Covfefe one spawned behind the barricade and couldn’t get to us. We advanced almost like a rank of infantry. As a group we talked to one another suggesting tactics and even order of activation so that we could clear a path to the next search token. Gruber, Deathmaster and Asmodeus went for one, whilst Ayla, Badger and Finbarton went for the other. Both Asmodeus and Deathmaster were capable of dealing with fatties (and Asmodeus could do it at range) so we figured send Asmodeus to clear the way, Gruber would open the door and Deathmaster would grab the trebuchet part. It was a foolproof plan. Right up until Asmodeus didn’t clear the path (unfortunate dice roll). This meant we had to adapt. Deathmaster had to commit to attacking the Fatty and Gruber would go for the Trebuchet part. This worked. Meanwhile, with a mixture of throwing things, knocking them down and slice and dice, the other group were advancing steadily. And then, disaster struck. A Group of Runners spawned right next to Deathmaster and Asmodeus. And then they ran forward and mauled the two of them, without them ever getting a chance to defend themselves (there were multiple runner spawns on the turn, but not enough runner miniatures so they became runner activations). Deathmaster and Asmodeus heroically gave their lives whilst Gruber hurried to his allies with the final Trebuchet part which Finbarton was able to assemble and fire on the horde. It was a player victory, but we lost two of our own. In the entire game, it never really felt out of control once. Some of the most annoying games of Zombicide I have ever played have been when I have played with folks who don’t get that it is cooperative, and that them getting to super powerful really fast isn’t a good thing. This game, as a party, we were in control. We shared resources appropriately. We kept an eye out for each other and we made sure everyone got a chance to level up. We did lose two characters but that was down to the draw of the cards and did happen in the final turn. And, if our original plan had worked, Grayson Gruber would have perished instead of Deathmaster. All in all, it was a fantastic game, and in my mind a good example of what the game is meant to be. I have heard of this game, but never played it. Seems fun! Scythe is getting a campaign expansion this year by all accounts. Yeah, I really enjoy this game. Not my favourite game system but I like the characters they have added that are not quite blatant rip offs. Some one always picks the giant. And the Amazon.